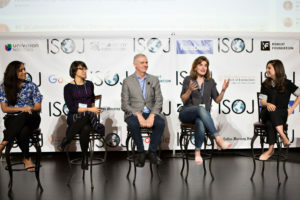 Watch video of the newsletter panel discussion from ISOJ 2018. With the seeming omnipresence of news and other media, newsletters are a tool to engage with audiences in a brief and an intimate way, according to panelists at the 19th International Symposium on Online Journalism on April 14, 2018. The panel — “NEWSLETTERS: How email, a 50-year-old technology, has become the next big thing for organizations” — was chaired by Sara Fischer, a media reporter for Axios who authors a weekly newsletter on media trends. Elisabeth Goodridge, from The New York Times, spoke about how her team creates newsletters. Of the 55 newsletters that The Times hosts, there is always a strategy in figuring out which ones should be refined, upgraded and approached differently. “We can guide, inform, entertain because email is so easy to experiment and refine with data, knowing what your audience likes,” Goodridge said. Gúzman said the newsletter was geared towards people who haven’t found their “tribe” in the city. “We came up with core values that we call CHUBI: curious, honest, useful, bold, and inclusive so whatever we do has to do with that,” Gúzman said. In order to engage with the audience, she said the newsletter has to be like a friend who is sending an email. TheSkimm is a newsletter targeting millenial women, striving to makes it easier to live smarter. Dheerja Kaur, the head of product and design for the company, said the newsletter provides a rundown of the news starting first thing in the morning. “Emails are a very intimate part of everyone’s daily lives and we wanted to go about in a way that didn’t ruin that,” Kaur said. The newsletter has no pictures since theSkimm team wants the audience to feel like the newsletter is a long text message from their smart best friend. Fernando Rodrigues, founder of Poder360, built the newsletter in Brasilia, Brazil, through friends and sources that were primarily in government roles in 2015. The paid newsletter was aimed at corporate clients. “We decided that in Brazil it would be very complicated to have some business that was based on public money so we ran away from that,” Rodriguez said. Even with their different newsletters, each of the panelists agreed that having passionate journalists is one the most important factors in their success. Video from the 2018 ISOJ is available in English and Spanish on YouTube.